We have the finest designers, and business-minded folk, to provide you with a responsive website system that is simple to update, will make a lasting impression on visitors and generates business. Update a fast and flexible website with focus on your own visitors' needs whether they use a mobile, ipad or desktop. NEW VERSION FOR 2016 - Grab a free copy of our booklet introducing CMS systems and business websites. We are friendly, creative and up-to-speed folk at the cutting edge of web technology, design & marketing. 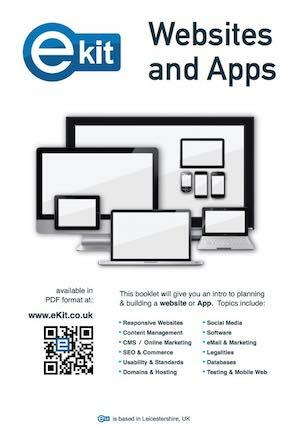 eKit has published a number of booklets, documents and papers to help you understand website projects and technologies. You can download them now! Our clients are our business. We are their design, development and support team for the duration of the project and beyond. eKit CMS clients include businesses, county and local councils, individual artists, charities and other organisations.